Currently the whole table (that in dropdown panel) is focusable. Should each table cell be focusable? Currently "more..." button uses cke_colormore class. Selected cells have inline background style. Thanks! The feature and code looks totally awesome. As soon as we'll be done with 4.4 we'll review it. Hey. Sorry for late reply, but we hit the same problem as in #100 (comment) - we don't have contributor agreement ready yet. I actually started a review some time ago and the first thing which I noticed was that this feature should be extracted to a separate plugin extending the basic table plugin. Better separation serves for better configurability and alternatively we would have to add a configuration option. We'll get back to this pull request as soon as we have contributor agreement. 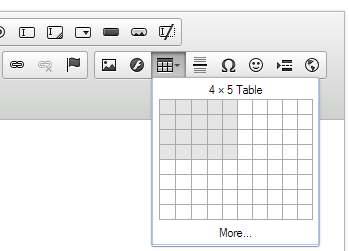 The quick table feature was extracted to Quicktable plugin by ufdada. Huge thanks to both of you! :) I think that I can close the PR now.